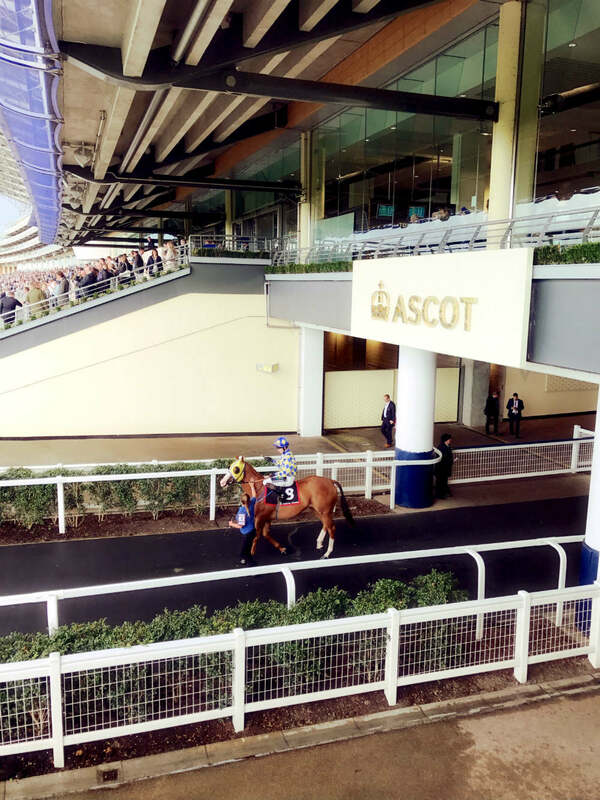 Ascot racecourse is one of those venues that you must see, and do, if just once in your lifetime. And Ascot racecourse, Flat Season, is the time of year to take in the festivities, and all without a strict dress code. 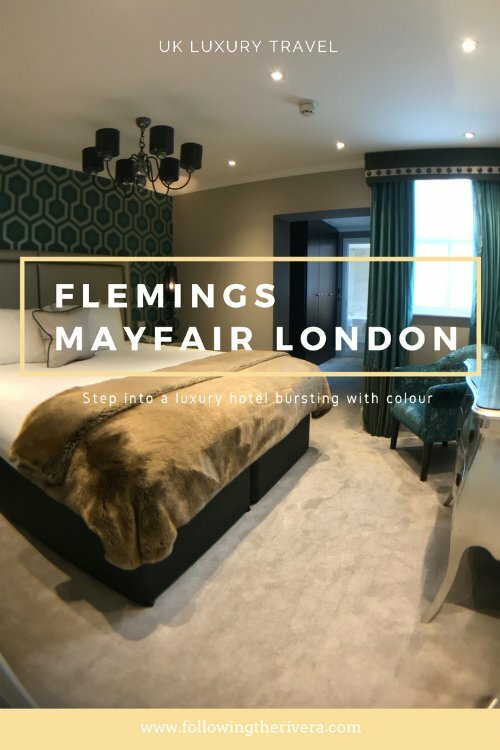 Forget whether you like horse racing, visiting the venue, taking in the atmosphere and even seeing Ascot itself is a fun, and very elegant day out. Ascot racecourse is located in the English county of Berkshire, and getting there is very straightforward. With some friends, we took the train from London Waterloo. Top tip: Always check the train status on the day of travel before heading out! We got delayed due to signal failures, engineering works etc. Very useful websites to check are TFL (Transport for London) and National Rail. As my friend rightly suggested, it may be cheaper to consider hiring a car for the day. Once your travel’s been sorted however, the train ride’s a pleasant one. It takes around 1 hour 15 minutes from London Waterloo, or 1 hour from London Paddington. The nearest station is Ascot, and it’s approximately a 12-minute walk to the venue. These times are all estimates, and depends on the day and time of travel. Heading out of the city and into the country means you get some pretty views of rural Berkshire. Whether from the train, or on foot, the scenery’s exquisite and a nice change from the concrete jungle of the city. Flat Season begins 3 May and ends 22 October, and relates to the dress code of the time of year. A big part of the whole Ascot experience is the dressing-up, and you’ll see both men and women elegantly turned out. For areas such as the Queen Anne Enclosure, there’s no strict dress code for men or women, although they do encourage smart dress. For the King Edwards Enclosure, ladies do have to dress smartly and also wear hats. Men have to wear a jacket with a collared shirt and tie — and definitely no trainers! The Ascot website offers some stylish inspiration in case you’d like to know what to wear. 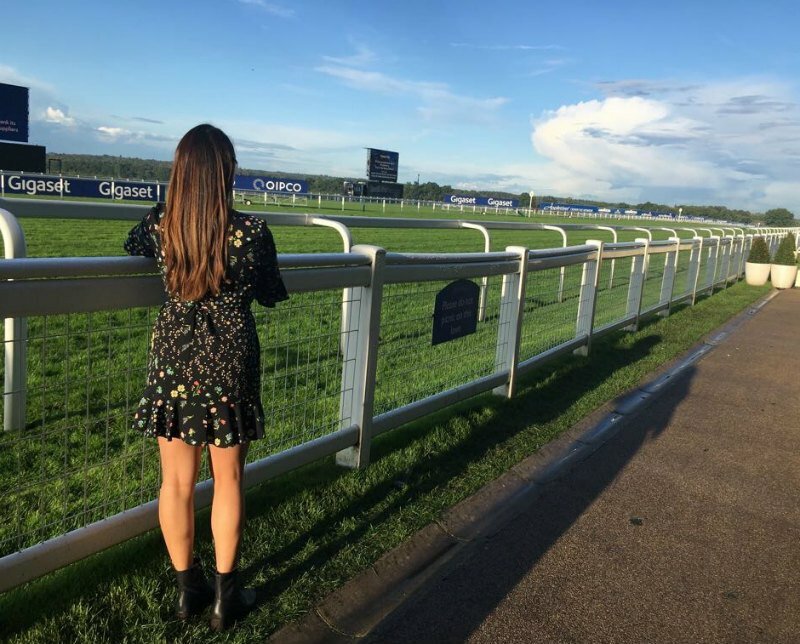 Ascot racecourse always has a variety of events happening, so check to see if any of them take your fancy. When we went, there was an international food festival taking place, as well as live cooking classes in a separate marquee. On that note, food and drink are aplenty, and there’s a lot of choice to choose from. I went for the fully loaded chicken, pesto and veggie crepe, which was perfect to munch on while watching the races. A purchase that’s very good value is the Wine tasting card. For £6 (€8; $8), you can ‘taste’ 6 wines on the menu list. I use the quotation marks here, because the quantity’s far from that of a tasting! In fact, my friend and I only managed 1 sad glass each! There are also plenty of stalls to buy Ascot souvenirs, or other edible goods if you’d like to take something back for loved ones. Alongside the spectacle of the dressing-up, the main draw of Ascot is of course the horse racing. Though by no means a fan, and with zero knowledge of the sport, I thoroughly enjoyed watching the racing. The card token tickets are more aesthetically pleasing than the paper one they give you at the betting windows. This means nothing to betting, but everything for your social media and photographs! More importantly, by buying beforehand, you’re more likely to only use the tokens you bought online, and won’t be tempted to want to buy more on the day. I bought £10 tokens along with my ticket to Ascot, and used these on 4 races. 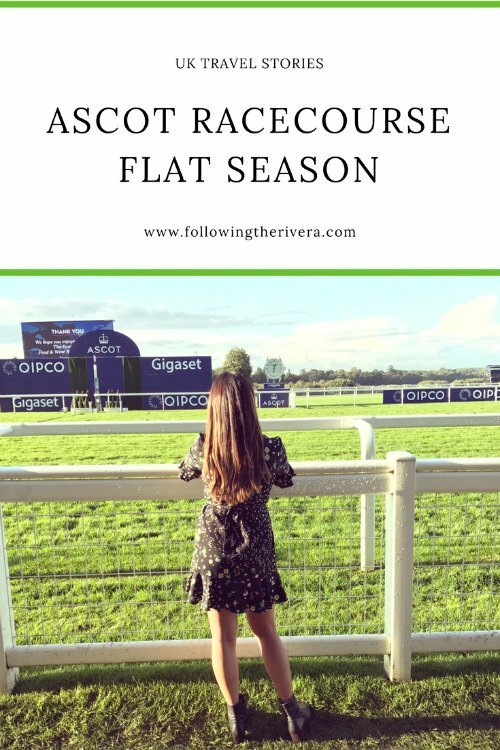 Overall, I loved every second of my Ascot Racecourse, Flat Season experience, and would recommend it to anyone. From the dressing up, to the adrenaline rush of watching the races, it’s the perfect elegant day out. Ascot racecourse is also something of a quintessential English experience, but a venue where everybody’s welcome. We went in early September, which is just about on the fringe on the last of the British summer! Saying this, do consider bringing an extra jacket as the climate can really drop as the evening arrives. Have you ever been to Ascot? If not, would you like to go? Let me hear your thoughts below! Oh I have heard a lot about Ascot. It is definitely on my bucket list. I love your elegant dress here. It definitely suits the occasion. Thanks Paulina, you should see it for yourself. Ok, those park benches have to be the cutest way to watch the races! I’d love to get dress up and watch the races! It sounds so old-timey, yet modern at the same time! I’ve never been to a race before! This looks like a lot of fun to watch. I love your outfit, perfect for a day at the races! Thank you! It was such a nice change to dress up and go somewhere different. Ascot’s something I’d highly recommend to visitors when coming to England. It’s always fun getting dressed up for a girls’ day out- did you wear a hat too? The wine tasting card sounds crazy good value, and a bit lethal (!) I haven’t visited Berkshire but have heard it’s got some lovely countryside too. I didn’t wear a hat, as it’s not required during Flat Season. Berkshire is really pretty and Ascot is a wonderful and elegant day out! I have never been to a big race course like this one. The ambiance must be so much fun. I once went to a race course in Florida but this one looks much better. Love that you can get there easily by train and thanks for the tip of when to go so you don’t need to dress up. You’re welcome Joella. 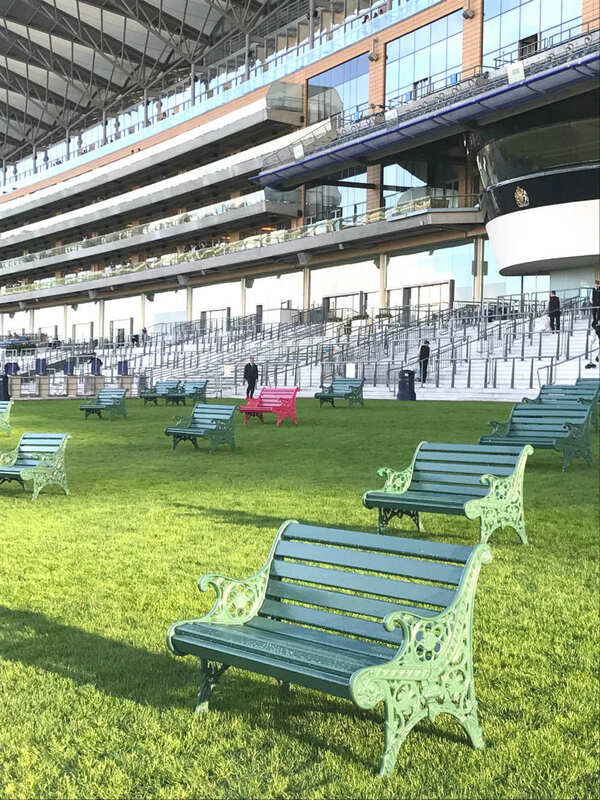 Ascot’s a great day out, and accessible to everyone. As long as you pay attention to the season and dress code, you’ll have fun! What a great experience this would be. It looks so beautiful, and it would be fun to get dressed up and feel like an insider! It was a great day out, and a memorable one too! I’ve never been to a racetrack before, but it looks gorgeous and sounds like it’d be a great day of pretending to be rich and famous! I love your posts, they’re so original, and you look so stylish too. Jealous! You need to go! It’s so much fun and the dressing up is nice too. I don’t usually go to the races but I also want to give it a try at least once in my life. I’m sure it will be exciting to experience that for the first time. Also, love what you are wearing on that first photo. It’s always interesting to read about the race day outfits! It was a first for me too! I loved the experience, and Flat Season means you don’t need to wear a fancy hat. It’s definitely worth thinking about if you visit England. Exactly, it’s something that I encourage all to try at least once! I’ve never been to a horse race, but for an event like this I’d probably give it a shot! The excuse to dress up sounds like lots of fun lol. I’d love an excuse to wear a fascinator! What a fun experience! I would love to attend a horse race once in my life, and on that note, I’d probably be very inclined to “dress to the nines,” as it were. But I also love what you wore too. Simple, chic, elegant! 🙂 Thanks for putting Ascot Racecourse on our radar for when we visit England next. So much to see and do! Love your guide and your dress too! Looks like a great day and something I really want to do myself! I’ve been to a few races in the states but none in the UK. So make sure you bookmark this one! Ascot’s a real one-off experience! seems like an interesting place to experience and get a bit of old English culture in. Interesting tips and looks like it’s worth a visit! I guess the formality has a lot to do with the fact that the Royals attend Ascot very often and it’s tradition. I have been to Chester races a few times which seems like a similar experience to Ascot. I had no idea there was a flat season in horse riding. The tokens for betting which you buy beforehand sound like a good idea, this should also stop you from getting carried away with the excitement and betting too much! That Park with those lovely benches have stolen my heart. All the greens in the pictures are very well captured. I am not a Racer but someday would defiantly love to go n experience this. It’s a glorious venue and a really nice day out. I’m not into racing either, but it was a lot of fun. I have never been to horse race and it is always my dream to attend such event. Ascot looks luxury and grass is also green. Elegant way of dressing in these horse races is so exciting.Helpful tips about tokens and betting. Thank you! It’s definitely one of those once in a lifetime things to do; and yes it’s a lot of fun! I have never been to a horse racing event and it seems like you guys had loads of fun. But like you said, the first thing that struck me when you said Ascot were those hats. I love dressing up once in a while and this is definitely a great way to have some fun too. I’ve never been to the races before and would love to experience it sometime! I love that there’s plenty of food and drink there. I’d actually love to check out the international food festival and the cooking classes that were there when you went! The food festival was a lot of fun, but we missed the cooking class from watching the races. It’s a real fun day out, and one I suggest everyone to try even once. I am yet to attend a horse race event. 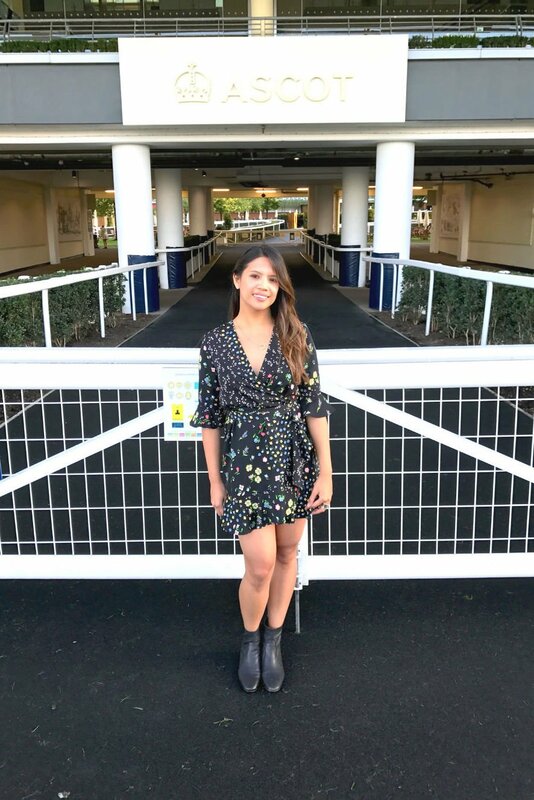 But what really impressed me about the Ascot racecourse is the dress codes for visitors and how they are giving importance in dressing during the flat season. This is quite an interesting fact about the Ascot racecourse and now I am tempted to visit it. I did Mariella, and if you love horses then you need to visit Ascot! It’s a great day out with friends, and you’ll have a good time! Never watched a horse race till now, but wouldn’t mind enjoying one in a course as good as Ascot Racecourse. Dressing elegantly is one of the major USP of these kind of events. Thanks, I hope you get to see it for yourself. I love how elegantly people turn up for these races. We have the Dubai World Cup every year (where I live) and the event is more about people’s dresses than the horse racing 😀 Is it the same at Ascot? As I went during flat season, there was no strict dress code but they do encourage smart attire. If you go during Royal Ascot, you have to wear a fancy hat! I’ve been to only 2 horse races in my life: in Hong Kong, where I only bet the equivalent of 1 USD and it was still so amazingggg! I almost won and I really became crazy for 5 minutes. 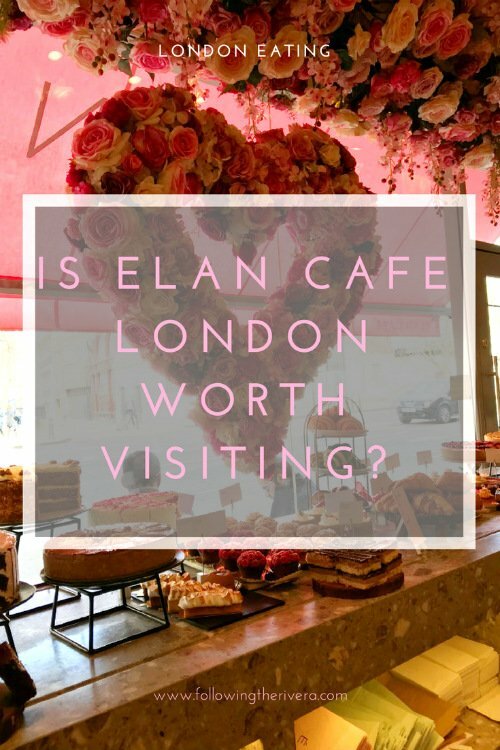 The other one was in Paris where I met so many Brits, so I guess it’s really in the culture, would love to experience that in England, and in Ascot racecourse for sure! Haha so you’re an expert then! 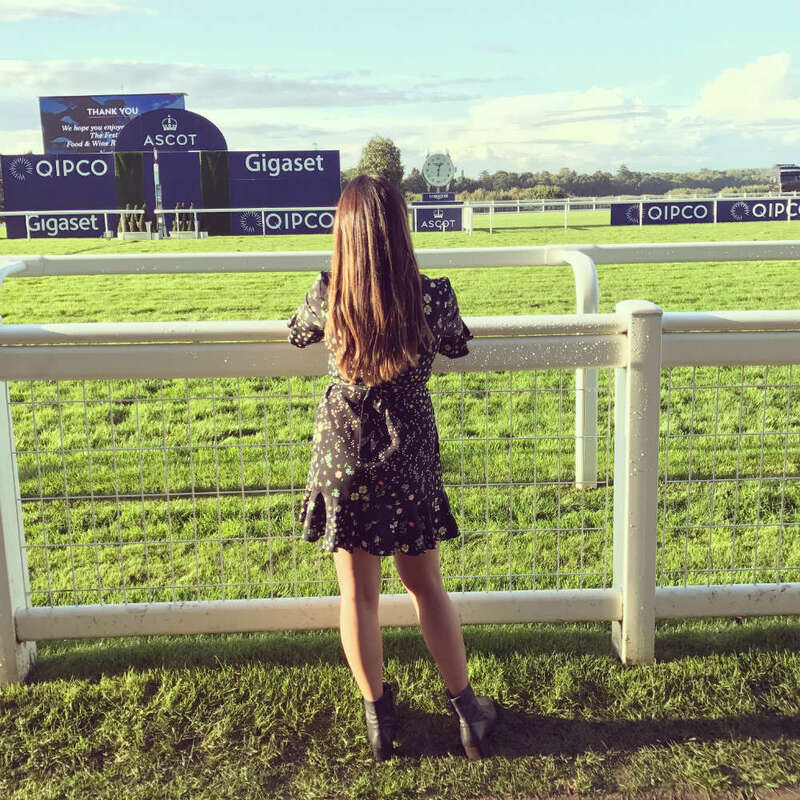 This was my first horse racecourse experience and it was so much fun. I highly recommend seeing it if you return to England. The area of Ascot is very pretty too. I had no idea that there is a special dress code for this kind of events. It sounds like a perfect idea for a special day out! It’s a great event, and one I think everyone should try at least once. Thanks Tracy, I’m so happy to read that. Lol that crepe was wonderful and the horse racing was fun to watch too. Aw, you need to visit the UK, it’s a great country with lots to see. I’ve never been to a horse racetrack before, but think I might need to change that. I actually grew up next to the Santa Anita Racetrack in California, but never ventured over. I always associate going to the races as a posh outing, full of beautifully dressed people, sipping on wine, and emanating old money glam. It really does seem like a relaxing, fun way to spend the day, if I’m honest. I would love to visit Ascot one day and take part in one of those fancy races. I love the dress-up code that Ascot has and I promised myself that one day I will buy one of those fancy hats just to go to a horse race. I did bet before but just online and whilst I won about £150, I lost them quite quickly haha. I was betting on horse names as I knew nothing about the horses. Did you win any of your bets? Ascot looks very similar to a track we visited just outside of Dublin. But it didn’t have the dress code. How fun to get out at an event that still cares about dressing up and sipping a little vino. Thanks for the tip about buying the betting tickets online, I bet it saves a ton of time and a good thing for slowing down the money spending. It was great, as we didn’t get tempted to spend more when there. Yes to the dressing up! It was a great day out and I’d do it all again! Somehow I always link Ascot with the Royal family, fancy dresses and top hats. It s good to see that there is so much to do also for ‘commoners’ ?? Curious though about that wine! Seems a bargain ? Safe travels! It usually is, but Flat Season is open to everyone. The dress code’s smart/casual and a fun day out! I haven’t been to any race but I watched some on TV and they are really good! I would love to observe a race in real life and buy some tickets like you did as well. Those benches look so cute by the way, and love the green grass! It’s a lovely scene and a fun day out with friends too! Oh wow, you’ve really gone for the most elegant event of the year! I’m sure that was an amazing event, and one I’ll bookmark to see one day. Ha, no, Flat Season is more lax and you can wear smart casual, with no hat required! Actually, I really enjoy wearing hats, so maybe I’ll re-visit another event! Thanks for the great post. In my mind races are always associated with grace… elegance about everything . Have not seen a post on race in detail so far .. thanks for reminding me I’m yet to see one ? I would LOVE to go to Ascot! There was a similar venue in Ireland and I was dying to go, but I never got the chance to make the trip and I deeply regret it. I also know nothing about horses or horse racing, but the dressing up part fascinates me! You looked super pretty in your outfit and I am sure you must have seen some extravagant attires around! I always enjoy looking at the pictures and checking out the quirky hats! Thanks for all the tips, Lisa! Hopefully I’ll get the chance to go at some point. What a fun day at Ascot. Having seen some of the races on tv, I wouldn’t mind getting to experience it first hand. Even when it’s dressed down a bit, it maintains the proper decorum and dress code. I’m not a better since I have no clue how racing works but the entire outing experience, even with less than perfect trains, sounds like so much fun!